I have had about 25 000 gold worth of sales the last week from crafted 815 leatherworking gear. And I have only ONE rank 3 recipe. The rest are rank 2 and I haven’t even stocked all the item slots. It seems to me that most people have forgotten completely about this market. While it won’t make you rich on its own it will give a very nice contribution to your gold and the barrier to entry is quite low. In general it seems to me that all the itemlevel 815 crafted gear is seriously undercrafted. The profit margins on the Leatherworking gear I post is between 60-200%. Which is amazing. Total gold is not crazy, but with my sales this week I’m looking at 10-15k profit at least. That’s nothing to sneeze at. All of the 815 recipes are gated behind the leatherworking questlines. For an overview over which quests you need check out the wowhead overview. To access the rank 1 recipes for Dreadleather and Gravenscale items you need to finish the quests Fel Tanning and Demon Flesh. They can then be bought from Stalriss Dawnrunner. From my experience you can make a nice bit of profit with just the rank 2 recipes, which are fairly easy to get. You can check the wowhead list or your profession window to find the rest of the rank 2 recipes. They are spread out over various factions and vendors. Rank 3 recipes will obviously increase your profit margins even more, but they are not necessary to make 100% profit margin. Several of the items I craft can be sold at double the crafting cost even at rank 2. IF the secondary stats are better it will sell for even more. The recipes that require Blood of Sargeras have higher profit margins, but they are limited by how many Bloods you can acquire. The recipes with no Blood requirements can be mass-crafted and that makes them more reliable in the long run. None of the materials required for leatherworking gear are hard to get, and you can easily find them cheaply on the Autcion House. If you have skinning on your Leatherworking you can go crazy farming bloods and leather for even more crafts. I have mostly crafted recipes that do not require the Bloods. As you can see from my sales above the gloves, boots, pants and bracers all sell at a decent rate. I have not yet experimented with all the item slots, but so far I assume that they sell decently as well. I have sold items for all of the slots I have crafted items for. You want to make sure that the item you craft are profitable on your server. You can check it either through the crafting cost in TSM or by using my spreadsheet which includes a sheet dedicated to leatherworking that includes all the recipe ranks. It was by looking at the spreadsheet I realized that I could make gold with the 815 gear even though I only had rank 2 recipes. Most likely you can do to. For your convenience you can find my TSM groups and operations on my pastebin. They should include all possible variations of the items, and the list should be comprehensive. If anything is missing please let me know so I can fix it. For instruction on how to import them refer to my post on jewelcrafting which includes an easy to follow guide for importing groups. Hopefully you can put this to use as well as me. I expect to ramp up my own operation with some restocking operations once I figure out how fast they sell. In the meantime, I’ll just do it by hand and be happy. Hey, just wanted to thank you for this comprehensive and well written blog. I learn something new everytime I come here ! I really like your philosophy about gold making, and if I get the motivation to start making my own gold, it will all because of you. At this time, I will be more thankful that I am right now. I’m looking forward to learn more knowledges from you, so keep it up ! How do you deal with all the various attributions. 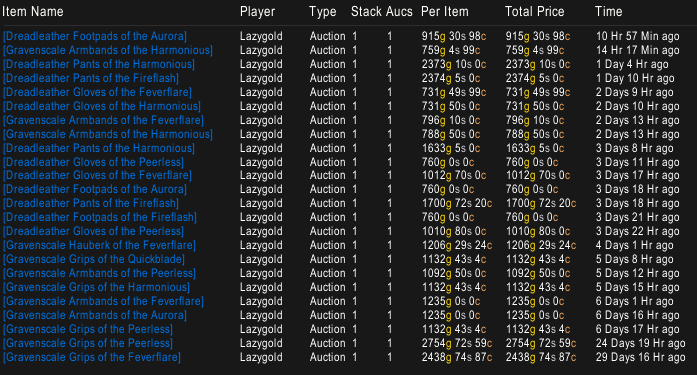 When searching for items prior to posting in the AH, I see a mess of items of various attributes but all “Leystone Armguards” with different sales prices and I am never easily sure which price to undercut like I am with raw materials. How do you decide which secondary stat is worth more? If you have all the variations in your TSM group it will just automatically undercut the right versions. I don’t know which, but some combinations have much higher prices consistently.